BDSwiss is an international brokerage firm established in 2012 with the current clients’ base of more than a million from over 125 countries, as well as additional exclusive Member club that has more than 700,000 traders. The approach of the company establishment comes from Switzerland and since then providing online trading services through a worldwide operating group with its headquarters in Switzerland and established offices in Cyprus, Mauritius and Seychelles. BDSwiss provides access to seamless trading through the range of 250+ underlying assets from leading Shares, Indices, Forex, Commodities and Cryptocurrencies with CFDs. The platform choice went to the popular and powerful MT4, which is a plus to many traders. By maintaining optimum support and assistance, refined products and full transparency the BDSwiss also educates their clients. Educational resources covering useful information on how to operate in markets, develop own trading strategy with accredited courses and webinars. Furthermore, the multilingual support available with constant support the trader requires daily, as well as allows to access useful information with market alerts, trading information and analysis through its established BDSWiss Blog. Is BDSwiss safe or a scam? BDSwiss is a trading name of the BDSwiss Holdings PLC, a company incorporated under the laws of Cyprus which also holds a CySEC license to provide its legal financial and trading services. As a state member of the EU, the Cyprus regulation fully complies regarding the provision of investment services with the European MiFID and MiFID II Directives designed to deliver safe trading environment and control the operation of markets itself. Thus, the BDSwiss company is eligible to provide services within the EEA zone, while the local authorities registered the company in their records of accomplishment or in simple allowing to conduct offerings legally due to broker’s records. Another BDSwiss operation offices located in attractive offshore zones Mauritius and Seychelles, which is registered by the Mauritius Financial Services Commission (FSC) and all in all enhance the broker’s possibility to offer its service to various residents globally. Even though the offshore registration does not give serious and safe compliance to the trading standards and operation, since BDSwiss in parallel is regulated by the European respected authority overall it is considered to be a safe broker. However, as we always recommend check on the regulation carefully and never sign in with an only offshore registered broker (read more why avoid trading with offshore brokers). According to the regulation, the security of funds along with the client protection delivered in multiple ways that ensure a safe trading environment and investors legal compliance. It is a fact that you are always protected as long as the broker is regulated by the regulations. Moreover, the BDSwiss registered with U.S. authority NFA as a member and an introducing company – BDSwiss LLC – authorized by NFA (U.S.) registration no. 0486419. The software solution offered by the BDSwiss mainstays at the popular choice of MetaTrader4 platform, that provides a comprehensive trading feature and vast of solutions. It is not actually a surprise, as MT4 is a known industry intuitive platform that allows trading anywhere and anytime with advanced charting tools, indicators to manage the risks with a better possibility to determine price direction. The available versions suited to various devices and including PC, Mac, Applications or Web platform that requires no installations. 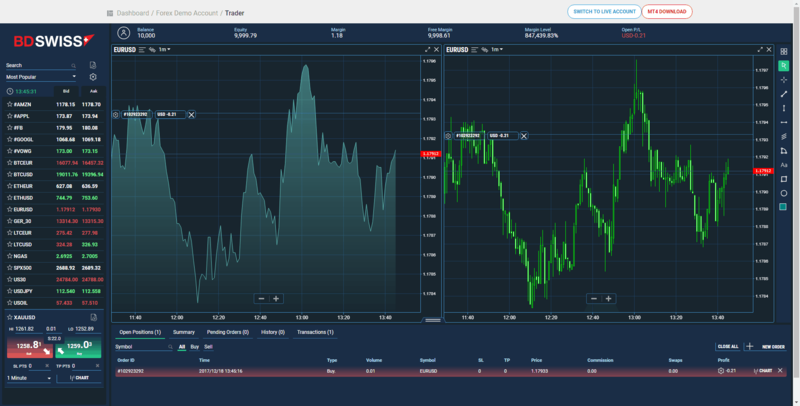 There are no questions why so many traders choosing MT4, as the platform is simply good with its charting capabilities, a range of tool and what is more pleasant a vast of add-ons that are available on the market and making the trading process a pleasant one. Moreover, there are plenty of strategies to choose from, that are useful for every trader, novice or experienced one. When opening your trading account there is an option to choose the desired currency through the selection between the Euro (€), US Dollar ($) and the British Pound (£). BDSwiss currently offers three main account types: Basic, Raw and Black, created to cater to the needs of different traders through lower costs according to trading sizes and advanced services. In addition, every BDSwiss client managed according to strict regulation as well as the account balance can’t fall below zero due to the applied negative balance protection. BDSwiss also does offer a Forex or CFD “Demo Account”, that is a risk-free feature to either learn or practice strategies or check the trading conditions before the live account is active. For trading fees on each underlying asset, you will find the usually applicable spread, the rollover for short and long positions, as well as the margin requirement. The applicable spreads and commissions charged when conducting trade and vary according to the account type. The Basic and Black account fees are all included in the spread, while the trader which prefer commission basis can adhere to the Raw Spread Account with an interbank spread and commission paid per transaction opening. To get a closer look, check below the comparison on most popular assets applicable to the BDSwiss Basic Account type as well you can compare BDSwiss fees to its peer XM Trading. Leverage, known as a loan given by the broker to the trader enables you to trade through the multiplied volume that may rise your potential gains, yet in reverse increases risks too. As such various regulatory standards and restrictions set a particular allowed level of leverage that is considered to be safe. However, the opinions of authorities are different, while European clients can now use only a maximum leverage level 1:30 for Forex instruments, the global traders may be still entitled for a higher range of up to 1:500. For most accurate data check on the official BDSwiss platform and verify its allowance with your residual status. BDSwiss works with a variety of payment service providers that ensures your possibility to cover a wide range of deposit methods in a particular country. 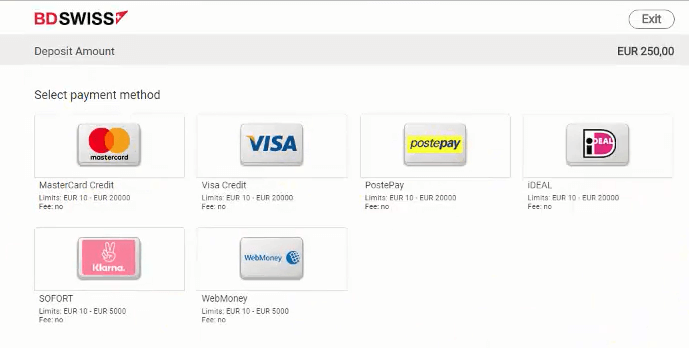 The methods including credit cards or bank transfers, Sofortüberweisung, Skrill and many more. Normally the minimum deposit required for you to start live trading is 200$, which is an attractive opportunity to many traders as a start with a Basic account. The pleasant moment is that BDSwiss does not charge any fees on credit card/electronic wallet deposits. The minimum withdrawal amount is $100, while in most cases the withdrawals processed free of charge. Yet in case you would like to withdraw less than the mentioned amount the broker may add on a fixed processing fee of 10$. An overall BDSwiss review shows a company, which managed to increase client portfolio to over a million customers through and thanks to its stable trading conditions and a global proposal that is suited to worldwide clients. The broker relies on Swiss expertise in finance and provides an opportunity to engage in trading to almost any resident, due to their regulation by the EU authority and other additional registrations. The trading costs and account types are among the average, along with the range of tools that bringing powerful portfolio feature and a possibility to trade popular Cryptocurrencies. In addition, the company runs an active blog and community of traders, which allows sharing the experience to get better knowledge about the markets and trading itself. So conclusion comes to the point of a quality BDSwiss offering that may suit either beginning trader or even the seasoned professional.